heather & olive: borrowing from the boys. This past weekend when I was up in Maine I popped into the Ralph Lauren outlet on a desperate search for some sort of a poncho. (Because, aren't all searches related to ponchos utterly desperate?) Instead of leaving with what I had in mind, I walked out with two men's shirts--for me. 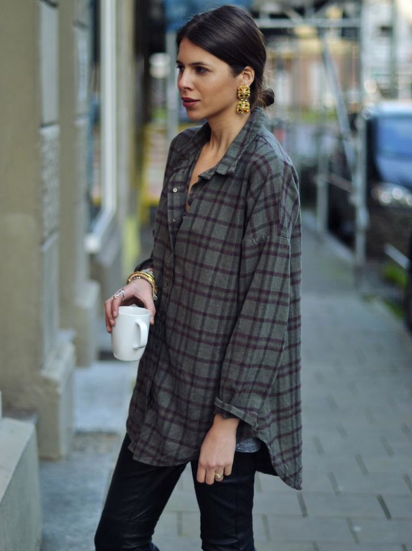 I think there's something so chic about a woman wearing an oversized men's shirt. Frankly, I'm ready to throw all of my lady versions out the window--the men's are so much more comfortable, and I don't have the button problem where I walk around town inadvertently showing off my brassiere. Would you borrow from the boys?